As I sat down to eat, spoon in hand, I checked the label on the box of strawberries—which I’d bought on sale at my local supermarket, Publix, for $2.99 the night before—to see whether the strawberries were locally grown. I was already certain that they were organic (strawberries are often listed as one of the top foods to buy organic, due to high levels of pesticides used to grow them conventionally), but March is strawberry season in Florida, where I live, so locally-grown was not out of the question. What I saw stunned me. A tiny label on the box read, “How’s my picking?” with a website and code number for my particular box of strawberries. I immediately went to my computer, typed in the website’s URL and found that, through the site, I could actually communicate with the grower of my strawberries and tell them exactly what I thought about their product. FreshQC (which stands for Quality Control) links your comments directly to the individual that picked your produce. When my daughters were young, we grew wild strawberries on the side of our suburban house—tiny red buds that burst in the mouth with flavor every June and July. It was through that garden, watching the joy of my children as they picked food and popped it directly into their mouths, that I learned the value of being connected to the source of my food. Now here I was, years later, suddenly able to communicate with those responsible for bringing me my breakfast. To the picker of my strawberries: I love you! Just so you know, I will be sending you my gratitude all day today. What a breakfast I had, giving thanks for you while munching my berries and thinking of the valuable time you spent doing something so important and humble, for me. The energy exchanged in my everyday actions means a lot to me, so when it comes to the foods I choose to eat, I try to sense the energy of it even before I consume anything. Does it feel like it will add to my energy, and my life, or detract from it? Even seemingly delicious-looking strawberries can sometimes feel just awful. It can be hard to explain this to some people, but when I buy organic produce it feels right to me. I’m happy to know that I’m not helping to expose the people picking my food to toxic pesticides. I would be eating just one little strawberry laden with chemicals, which my healthy body is probably able to handle, but if I support chemical agriculture, it means that you have to be immersed in the stuff all day. Thank you for what you do. Big blessings to you and your family. Love, Maureen. 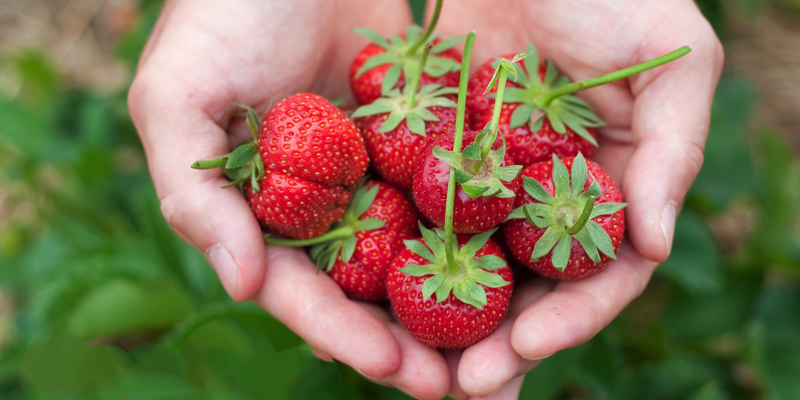 What would you write to the picker of your strawberries, your cucumbers or collard greens? Take a look around your kitchen today and—even if your produce doesn’t come with a website like QC—take a moment to send a mental note to those who touched your food along the way. A simple acknowledgement or heartfelt “Thank you!” can make a wonderful pre-meal prayer, connecting you to the farmers, pickers and producers of your meal. So often, gratitude is the key to feeling truly full before we even have a bite to eat.